“We believe it is important for senior citizens to help shape future services. Senior Citizen Councils can be a platform for senior citizens to make themselves heard,” says Beata Tokarz-Kamińska from the Association of Creative Initiatives “ę”. Poland is ranked at the bottom among the EU countries on the Active Ageing Index (AAI) from 2012, scoring particularly low on social participation. Poland is also scoring low on the Global Age Watch Index from 2014. Surveys have showed that a large majority of Polish senior citizens believe they have little influence over what is happening in their local communities. “The idea of local self-government is not something senior citizens in Poland grew up with. Therefore they find it hard to partner with local governments. A lot depends on civic education and giving them specific tools and instruments for participation,” explains Tokarz-Kamińska. “Our role is to take assist in the consultations between the Senior Councils and the local authorities. We are teaching the Councils how to consult on policy matters. At the same time, we encourage the local authorities to consult with the Councils on projects that matter for them – like easier senior citizen access to parks, buildings and other public spaces,” explains Tokarz-Kamińska. 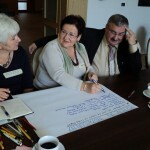 The project includes a research study of Senior Citizen Councils from different parts of Poland. In addition two guidelines will be developed: One for civil servants and town planners on how to design senior-friendly towns and one for senior citizens on how to actively get more involved in their local community.